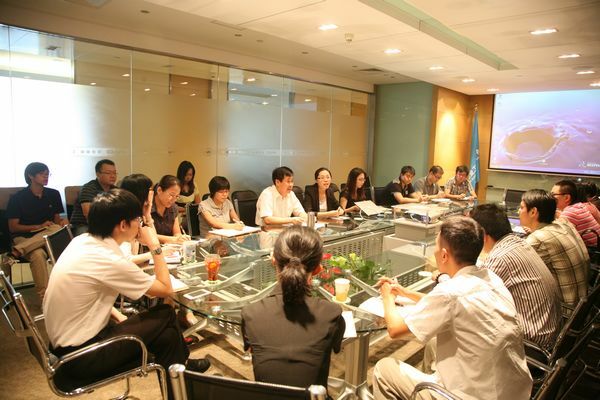 New staffs training conference was held in company meeting room On August 22. CFO Zhao shuangjun attended this meeting and delivered an important speech. Some department heads made presentations of their own business fields. The meeting is chaired by HR General Manager assistant Zhang Ran. CFO Zhao shuangjun introduced company’s background, business compositions and development process. He pointed out that the growth of staffs included the growth of business and management capability, and also included improved comprehensive quality and human mind. Employees should have strong senses of responsibility, dedication and aggression, and also have loyal to their professional ethics. For CNAICO, your participations have brought new hope; the company will strive to create a favorable developmental environment. I hope you can constantly update knowledge, improve learning ability in all aspects, and become useful to the company as soon as possible." Zhao shuangjun said. New staffs training is a long-standing activity of CNIACO, aiming to build a communication platform between new staffs and all sections to enable new staffs understand CNAICO's work ethic, related business systems and management requirements.